All aboard the Autumn Train Ride for some awesome autumn reads and prizes! Do you have a favorite fall memory linked to a train? What do you imagine you would see if you were riding a train in the fall? 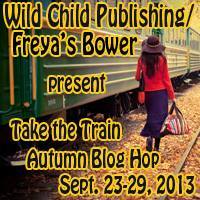 Join the authors of Wild Child publishing and Freya's Bower as we Take an Autumn Train Ride through our blogs. of "Battle for Blood: The Blood Feud"
winner's name as a character in Kissa Starling's next sweet romance story. Blood of the Dark Moon is the first book in the Dark Moon series. Blurb: A dark flame of passion ignites between Amanda, a devoted follower of the Greek god Apollo, and Jesse, a handsome scholar who shares her love of both the classics and the occult. But little does Amanda know she is destined to fulfill a legacy that began long ago and ended in tragedy. Together, she and Jesse embark on a journey down a shadowy path that delivers Amanda into Jesse’s scintillating underworld of vampires, magick, and secret societies. Will she learn her true identity in time to help those she has grown to care for, and find happiness in her new life with Jesse? And will destiny finally be fulfilled? You can buy Blood of the Dark Moon either directly through Freya's Bower or through Amazon.com and BN.com. More about this book can be found on this page. Amanda ran down the street, taking advantage of the crowd already going through the crosswalk in spite of the oncoming traffic. She made it to the coffeehouse with two minutes to spare, ordered herself a mug of mocha, and sat down at one of the tables in the corner. The too-hot mocha burnt her tongue, but it gave her something to put in her system before she met some guy whose first name and email address were all she knew—that and an apparent mutual interest in ancient studies. The magazine from one of the tables and the mocha distracted her from her nervousness, and after a time, the rest of the coffeehouse. She thought she heard someone calling her name. She lifted her head from her magazine to see a young man who appeared to be in his late twenties, perhaps early thirties. He looked at her with intense, dark brown eyes. "Amanda? You are Amanda, right?" She smiled. "Yes, that's me. You must be Jesse. Here, have a seat." She gestured towards the chair on the opposite end of the coffee table. He took it with a grateful grin. She noted that his chosen attire included a leather jacket, a dress shirt, and a pair of slacks—all in black. A silver chain hung from his neck, but she couldn't see the bottom of it, for the rest lay concealed under his shirt. His short, slightly wavy dark brown hair was neatly combed. One thought leapt to her mind: Business goth, perhaps? I wonder if he's Italian? She figured probably Italian but of mixed heritage, for his skin was paler than average, especially against his attire and dark hair and eyes. His smooth features reminded her of a Roman sculpture. Jesse smiled, and she realized that his features appeared quite striking to her, even by her particular standards. His email initially brought all of the academic stereotypes to mind; Jesse sounded very intelligent and thoughtful. It made her anticipate meeting a very prim-and-proper looking gentleman. J Crew with a side of geek, perhaps. "Do you come here often?" he asked. "I hear their vanilla chai is pretty good." She blinked, realizing that she had been staring at him. "Vanilla chai? No, I've never tried it. I've come here maybe once or twice. I typically don't have time outside of my studies," she added in an almost apologetic tone. He chuckled. "Yeah, so I figured." His face got serious, and he rubbed his hands together. "So," he said, "I hear you're an expert on Ancient Greece. What got you into the subject?" Amanda sipped her mocha before answering. "My religion." His eyebrows went up slightly. "Your religion?" "Yes. My beliefs are based on Ancient Greek religion." She gave him a shy smile. "I'm actually a devotee of Apollo." He blinked hard, clearly taken aback. "Really?" "Great." He grinned. "I'm actually a Kemetic myself." She nearly choked on her drink. He laughed quietly as she sputtered and coughed. "I take it that I don't look the part?" he asked with a fairly amused tone, taking in her reaction. "I, um," she managed to choke out, "wasn't expecting that. I typically run into either atheists or Christians who think that my soul needs saving, or something. And don't even ask about the academics." She coughed some more, feeling her cheeks grow warm—and not due to swallowing her mocha the wrong way, either. She tried not to cringe in her embarrassment. "Yeah, just went down the wrong pipe." She gave him a quick smile of reassurance. "Looks like we have some things in common. But, I gotta ask, why is a Kemetic like you interested in my, um, research about Ancient Greek religion and Apollo?" He looked at her questioningly before glancing in the direction of the counter where people were ordering coffee, then turned his attention to her again. "Actually, my interest is somewhat on the, well, unusual side. I'm fascinated more by the mystical elements in common between both religions." He gave her a lopsided grin, his friendly demeanor giving way suddenly to a shy awkwardness. "I'm sure that you know of the Greek Magical Papyri?" "That mishmash of Greek, Egyptian, and Hebrew spells? Yes, along with several other books on ancient Greek magick on my shelf." She leaned back in her chair, completely intrigued by this guy. What exactly was he about? Curiosity struck her, and she dared to ask, "So, do you study, practice, or both?" His mouth fell open slightly, but he closed it fast. "Since you ask...both, actually. I have an interest in magick and mysticism." He shrugged. "One of my many hobbies." He smiled. "Ah," she half-smiled in return. She had no clue what to make of this individual whatsoever. She wondered if he were completely out of his mind or just easily impressed by women who attempted to earn an academic degree in unusual fields of study. He leaned forward slightly and looked into her cup. "What are you drinking?" He nodded thoughtfully. "Mocha. Okay. I think I'll grab some and then I'll be right back." "Gotcha. I'll be here." She watched him go to the counter and order the beverage and began wondering just who Jesse truly was. He didn't look like your standard occultist; aside from the all-black attire, he looked like someone who had just stepped out of a law office or some other professional building. Jesse also handled himself in a very assured, graceful manner—not to mention so far sounding reasonably intelligent and well spoken. The fact that he was good-looking as hell also disturbed her slightly. Perhaps more than slightly, she admitted. She continued to sip her mocha thoughtfully, maintaining a casual expression on her face as she continued to watch him order at the counter. Amanda hadn't dated anyone for a while; her studies kept her from socializing very often. She realized that she hadn't had much time to meet any potential significant others since high school. This side of things made what she had hoped would be a nice, professional meeting with an interesting conversation or two into a not-too-welcome distraction in the least. Amanda originally envisioned the potential of helping someone with their own research into the classics, particularly in her fields of study. She sighed, praying that this wouldn't keep her from finishing her thesis. She frowned slightly, remembering his earlier words. Amanda also possessed a strong interest in theurgical practice. Being a devotee of a Greek deity renowned for oracles and divination, she frequently received dreams and visions from Him that later proved themselves accurate. Nothing about this man or her meeting with him came from Apollo in earlier dreams or visions—not a peep. This struck her as strange and seemed to imply that either this guy would prove unimportant in the long run and would fade from her life quickly, or...perhaps the oracular god had reasons for not telling her. Either way, Jesse piqued her curiosity, and she wished to know more about him. He returned with mocha in hand and sat back down in the chair. "Okay," he stated, "Now where were we?" "Ancient Greek magick, I believe." She gave him an inquiring look. After all, this face-to-face meeting came about due to his email. "Right. Ancient Greek magick." Jesse put down the drink and began to talk about the reasons for his interest in her thesis. It struck Amanda that he seemed to know a bit more about her than she'd initially thought. After an extensive conversation on folk magick versus religious magick, the discussion somehow got into modern magickal practices. Apparently Jesse's studies spanned a number of subjects, including Golden Dawn and Thelemic work. She knew of the Golden Dawn and worked on her own as a solitary practitioner via her studies in books by Israel Regardie and the Ciceros, but he had her beat on knowledge of Thelema. He chattered enthusiastically about some ritual he referred to as "Reguli", which she had never heard of, and also referred to texts that he claimed resembled Thelema in some ways, but contained more ancient practices and beliefs. Amanda tried to press him for more information, but he kept changing the subject. Her thesis work fascinated him, particularly in regards to personal religious practice in Ancient Greece, and thus he had assumed that she might know something of the more esoteric religious practices that also took place. Referring to himself as an "occult geek", he stated in the same breath that he wanted to learn more about Greece. He'd studied some of the Greek influences that made up Egyptian practice—and more in reverse—and wished to learn more from her. Rambling some more, he talked about how he "sorta stumbled into hearing about her work," and about his intense interest in the subjects she studied. Curious, she thought skeptically, wondering if he belonged to one of those "trad Wiccans" who claimed to have witches in their family dating back to year 30,000 BC. Propriety kept her from chuckling out loud at the thought. Glancing at the clock on the wall, he announced that it was getting late and would she like to continue the conversation at another time? She nodded, amazed to see that the clock indicated a time of eleven p.m. They had been talking for the past three hours. As she grabbed her bag, she observed that his mocha was hardly touched, if at all. They started to walk out of the coffeehouse, and she noted appreciatively his opening the door for her. "So where did you grow up?" he asked. "I've been talking to you this whole time about ancient languages and cultures and have completely forgotten to ask you about your present." He smiled at her as if in apology. "I grew up in Westchester County, but moved here after I graduated from high school. I've lived here in the city ever since." The rain had finally stopped, and the streets held that damp smell mixed with the scent of city grime and street corner hot dogs. "Do you like it here in the city?" She nodded. "I like the pace." "You must live off-campus, I presume?" "I can walk you to your building, if you like. How far away is it?" She hesitated. She barely knew this guy, and giving him information about where she lived before she got to know him better didn't seem like a safe idea. "I take the subway," she said. "But it's not far." He nodded, looking at her facial expression, which she hoped appeared blank. Then he smiled. "I'll walk you to the subway, then." She nearly sighed with relief. Jesse seemed like a nice guy, but certain habits were drilled into her that she couldn't get rid of, and being paranoid of new people—especially strange men—was one of them. "Would you mind if I called you sometime? I had a great time tonight and, well, I'd like to speak with you again, if you don't mind." Amanda glanced up at him. It occurred to her that he seemed shy beneath the surface. Maybe he's interested in me romantically or something? It was then that she realized that he wasn't that tall for a guy—probably wasn't more than 5'11" in comparison with her 5'6". He seems to carry himself as if he were taller. She smiled at him brightly and gave him her cell phone number. He took it with a grateful nod, mumbling something about how he really enjoyed talking with her and he didn't know many people who shared his interests. A strong electric shock struck her deep at the core of her being as his fingers touched hers, accompanied by a heaviness in her chest. The Moirai have their hands in this, she suddenly thought. She wondered if she would dream of him that night, and if so, what she would dream. Please visit these sites for more chances to win, the more you visit the more chances you have to win. We have 46 participating authors. You can stop at as many or as little blogs as you wish. At each stop, you will find either two chances to enter per blog to win some awesome prizes. If you visit all, that's 92 chances to win! There will be five, lucky winners.